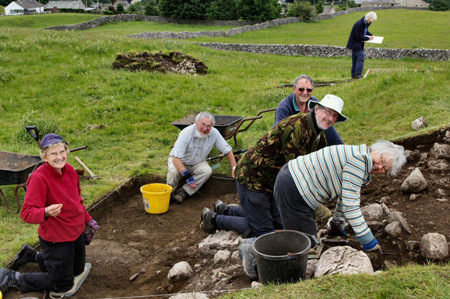 Guided by the topographical and geophysical surveys, we investigated some of the features near Grassington to see if we could find out what evidence survives, and how old it is. 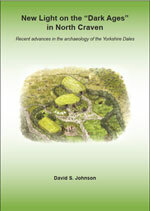 In the topsoil we found recent material comprising glazed pottery and fragments of metal including iron nails and lead. This material is no more than a couple of centuries old, and was probably scattered across the area along with ‘night soil’and rubbish from Grassington. The high resistance anomalies on the large bank turned out to be loose piles of stones which had probably been cleared from the fields on either side and thrown up onto the bank, perhaps around the base of a tree. We didn’t find any evidence that the bank itself had been created artificially, but this could be explored further in future. Clearing the turf and topsoil in other areas revealed that enclosures had been created against natural bedrock outcrops, rather than the massive building foundations suggested by the geophysics; there was nothing to indicate the age of these structures. 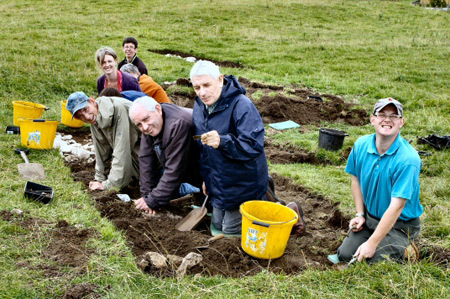 Volunteers from Grassington were joined by pupils from Upper Wharfedale School and an archaeology group from the WEA Digability project.